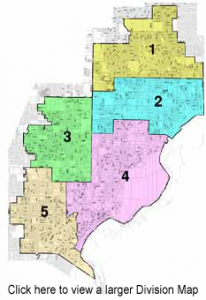 The District is governed by a five member Board of Directors. Each Director represents their division (Divisions 1 through 5) and the ratepayers as a whole. The Directors are elected by the customers of the District and serve four year staggered terms. If you wish to communicate with a member of the Carmichael Water District Board of Directors contact the District at (916) 483-2452 or PublicInformation@carmichaelwd.org. Click on the Director's name to veiw their bio and photo. George “Roy” Leidy is a senior aquatic ecologist with AECOM, a global provider of professional technical and management support services. Roy specializes in conservation biology and fish and wildlife management. Director Leidy was appointed to the Board of Directors for District 1 in September 2011 to fill the unexpired term of a former director. He has a B.S. degree from U.C. Berkeley in resource management and has been involved in a broad range of California water management issues since 1974, including endangered species, water resources, watershed management, instream flows, water quality, habitat restoration, and regulatory compliance. He possesses extensive knowledge of resource management issues in the western United States. Roy is a member of the Carmichael Elks Lodge #2103 and has lived in District 1 for over 12 years. Mark R. Emmerson is employed with the California State Water Resources Control Board. He was elected to the Board of Directors in 1996 to represent Division 2 and has served as Past President of the Board. Jeff Nelson is a licensed Professional Civil Engineer with the State of California and is a Director of water/wastewater services for NV5, Inc., an international engineering consulting firm. Jeff has a Bachelor’s of Geological Engineering degree from the University of Minnesota and a Master’s Degree in Civil Engineering from San Diego State University. Jeff was elected to the Board of Directors in November 2018 to represent Division 3. Ron Greenwood is a Realtor with Lyon Real Estate. He has been selling real estate for over 25 years, with eight of those years managing for the company. He has a B.A. Degree from the University of Texas at El Paso. Ron is a longtime Carmichael resident (nearly 35 years), married for 38 years and has four children and four grandchildren. He is past president (2015) of the Sacramento Association of Realtors (SAR) and Outstanding Life Member of SAR’s Masters Club. Ron has been a director for the CWD since 2007. During that time he has gained a strong reputation within the water industry, representing the District on the Executive Board for the Regional Water Authority (RWA). He is a Commissioner for the County’s LAFCo (Local Agency Formation Commission), and is a representative at ACWA (Assn. of Calif. Water Agencies), plus served on the Board of Directors for ACWA’s JPIA (Joint Powers Insurance Agency). As a director, Ron has served the district in resolving labor disputes, has helped review requests for proposals (RFPs) and contracts for vendor services, worked on rate studies, and worked to help develop new sources of revenue for the district. Most importantly, he works laboriously to preserve our water rights and way of living. As a strong believer in community service and volunteerism, Ron is a past president and active member for the Kiwanis Club of Carmichael, serves on the Carmichael Chamber of Commerce, was a founding director for the North Area Teen Center, and served as Chair on the Carmichael Park Aquatic Center (CAP) Committee. Paul Selsky is a Civil Engineer with Brown and Caldwell. He earned his B.S. in Civil Engineering in 1976 from the University of Virginia and is a licensed Civil Engineer in California and Wyoming. He was elected to the Board of Directors in November 1996 to represent Division 5 and has served as Past President and Past Vice-President of the board. He is a member of the American Water Works Association. Click on the Manager's title to view their bio and photo. Steven (Steve) M. Nugent’s career in the water industry began in 1981: Del Paso Manor Water District, Serviceman 1981-1985; Carmichael Water District, Pump Operator 1985-1988; promoted to Foreman 1988-1990; Elk Grove Water Works (Private Water Utility), Operation Supervisor 1990-1994; Carmichael Water District, Production Supervisor 1994-1995; promoted to Assistant General Manager 1995-2003; served as Assistant General Manager for eight years and was promoted to General Manager July 1, 2003. Steve is a member of the Sacramento Water Works Association (SAWWA) and American Water Works Association (AWWA); SAWWA Water Education Committee, Co-chairman 1993-1995; SAWWA Well Testing Committee, Chairman 1993-1998; assisted California State University, Sacramento (CSUS) in developing an educational video series for Department of Health Services Water Distribution Operator training 2002-2003; AWWA Research Foundation Micro-Filtration/Ultra-Filtration Project, participant 2003; taught water distribution and water treatment classes for operators. Steve was a presenter at the following conferences: 1997 AWWA National Membrane Technology Conference, Developing Membrane Filtration Criteria for a 22 MGD Surface Water Treatment Plant: The Carmichael Water District Experience; 2000 NAUC No Dig Conference, Micro-tunneling 2,200 feet of 60 inch Pipe Under the American River; 2000 SMUD Water Disinfection Conference, Bajamont Water Treatment Plant; 2002 National Water Research Institute (NWRI) Conference, Full-Scale Drinking Water Treatment Plant Using Micro-Filtration: Carmichael Water District; 2003 AWWA CA/NV Section Water Well Technology Conference, How to Avoid Contaminating Groundwater During Development and Operation. Lynette S. Moreno’s career in the water industry began in 1991: Elk Grove Water Works (Private Water Utility), Customer Service Specialist 1991-1995; promoted to Administrative Manager 1995-1999; Carmichael Water District, Business Manager 1999-2003; served as Business Manager for four years and was promoted to Assistant General Manager July 1, 2003. Lynette graduated from the University of South Florida, Tampa in 1991 with a BA from the College of Arts and Sciences, majoring in Geography with emphasis in mapping/GIS. She is a member of the Sacramento Water Works Association (SAWWA) and American Water Works Association (AWWA); RWA Conservation Program, participant; ACWA/JPIA Human Resources Group, participant.